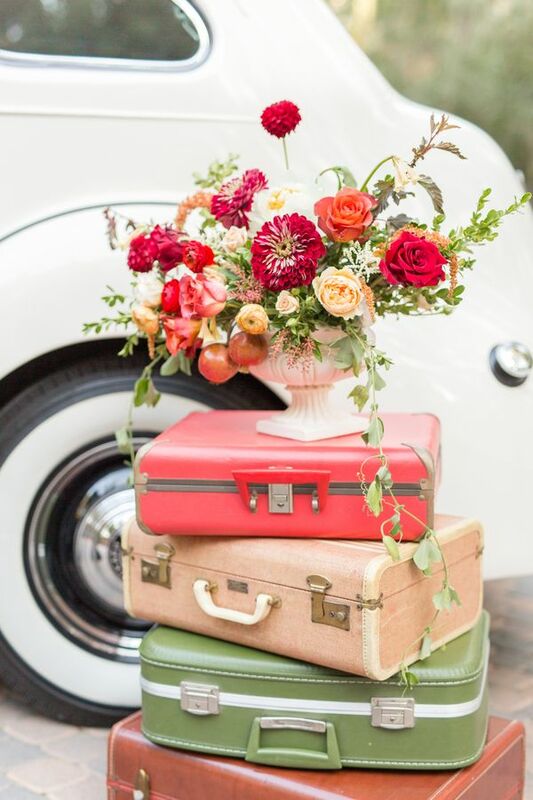 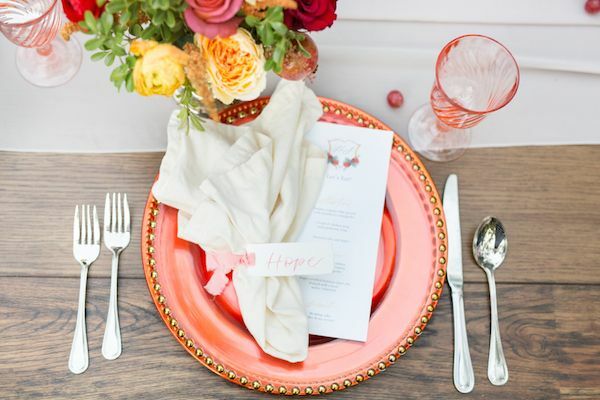 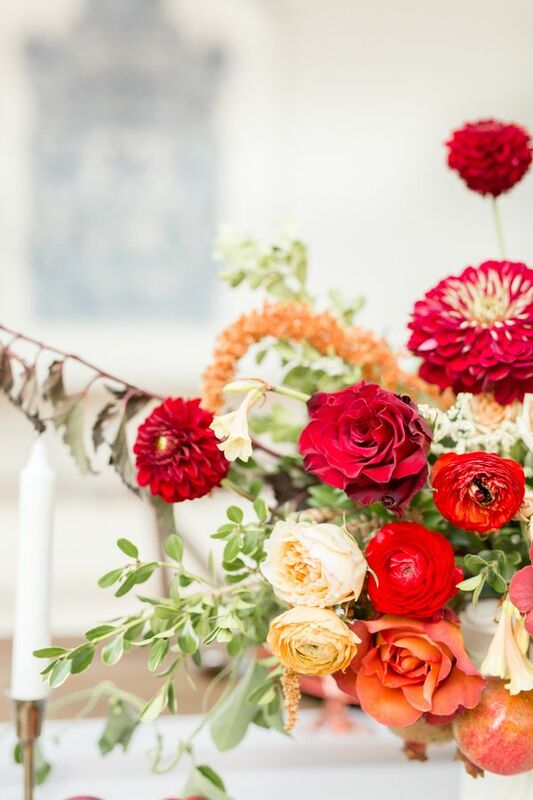 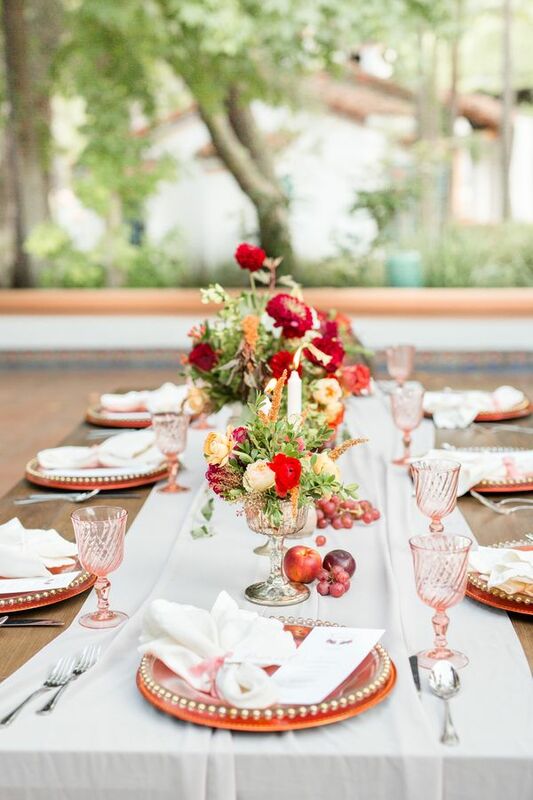 What happens when Heather Benge Events and team get together with a wedding vision as colorful and inspiring as this one? 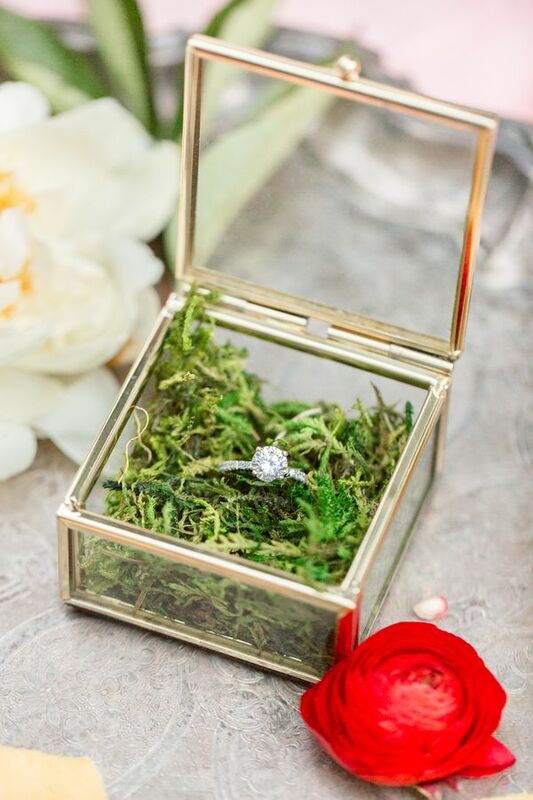 Well, m'dears — wedding dreams come true. 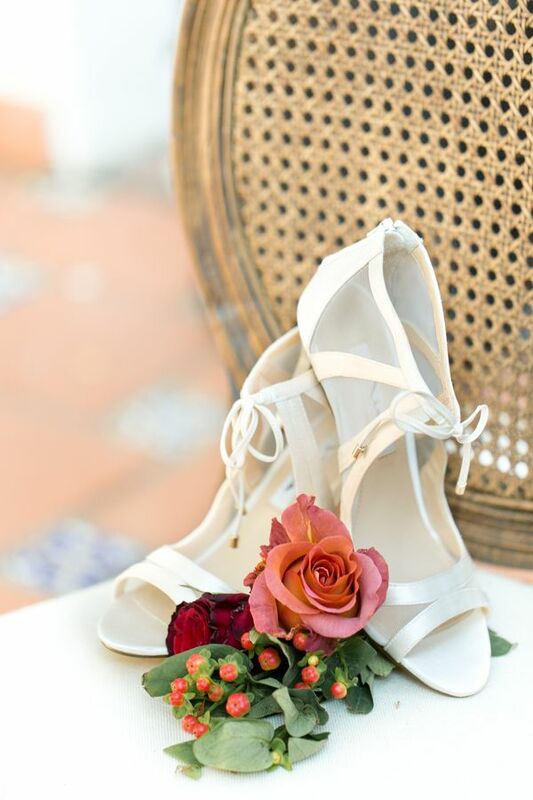 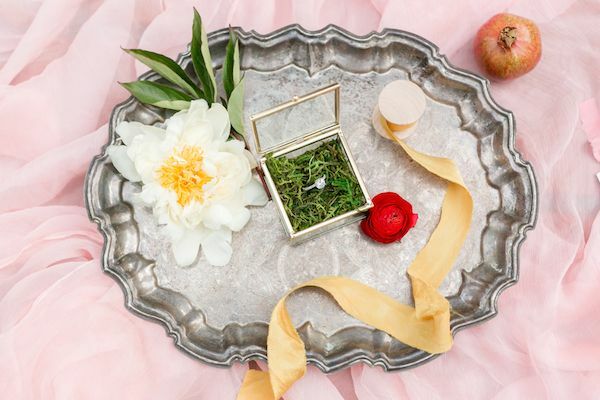 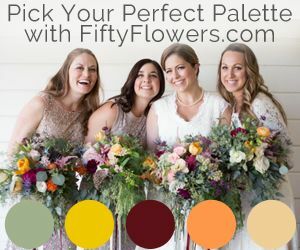 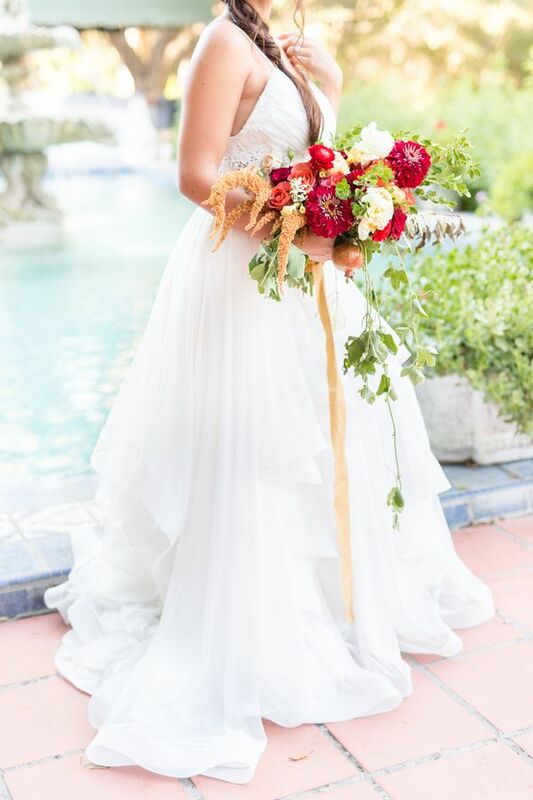 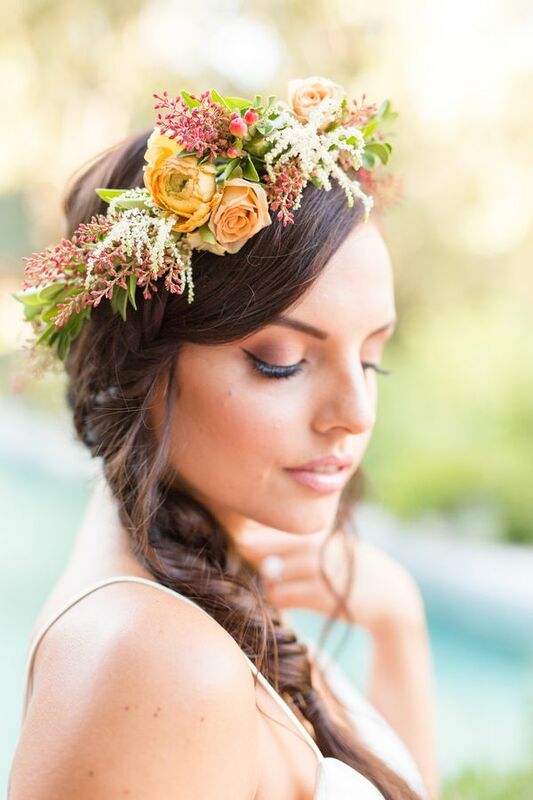 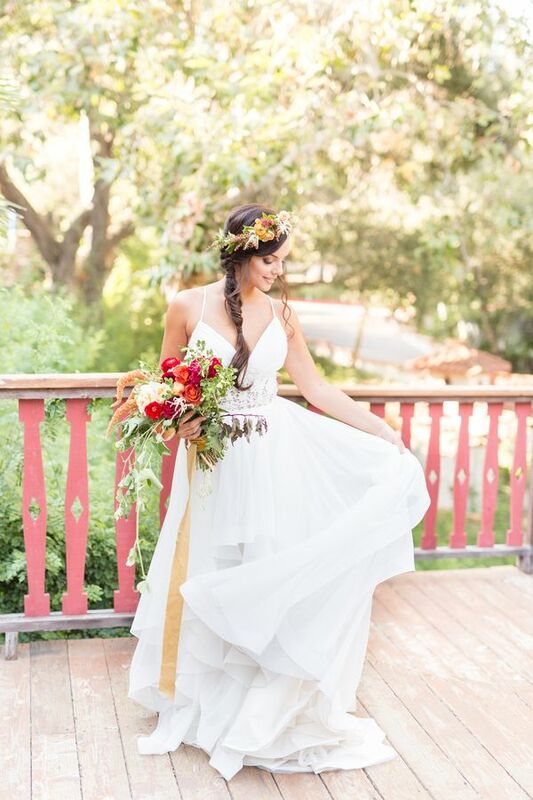 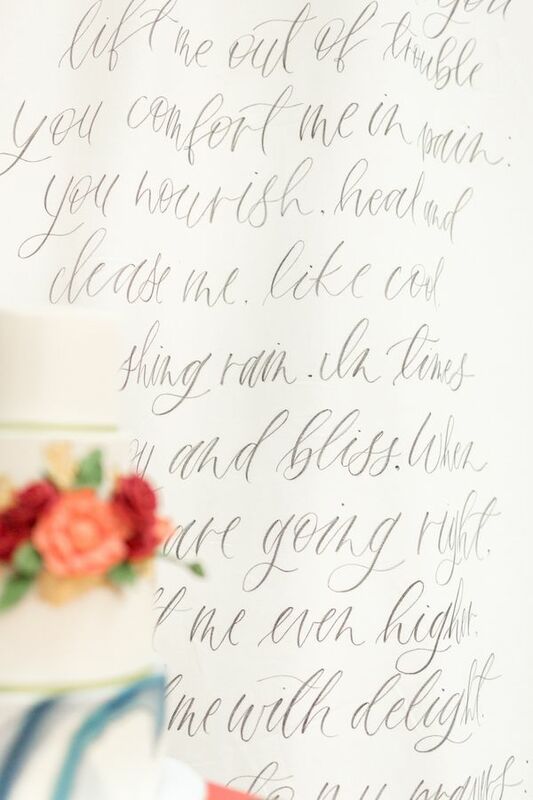 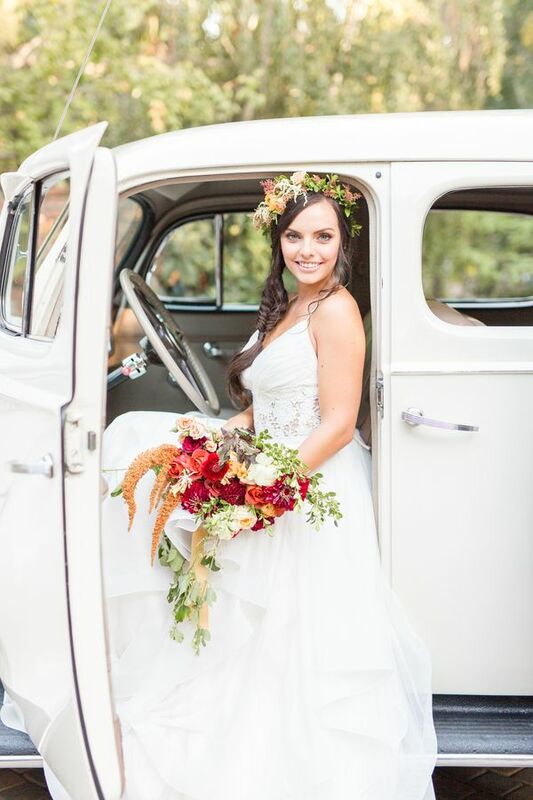 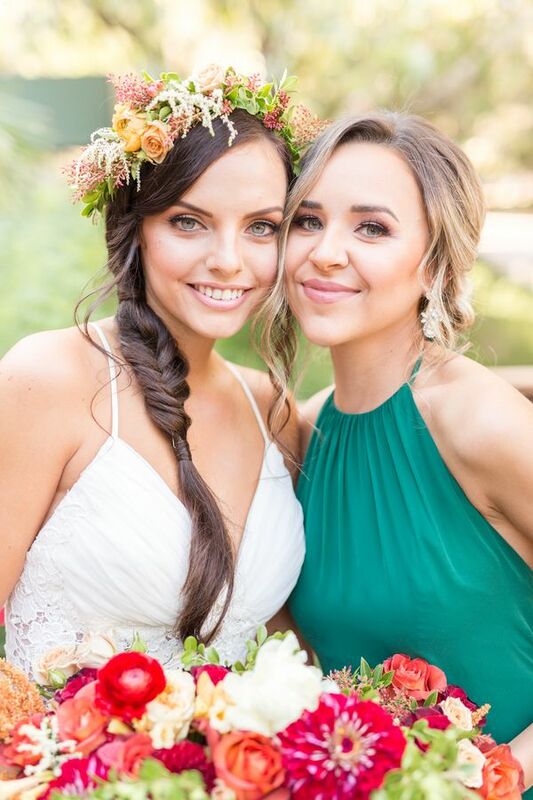 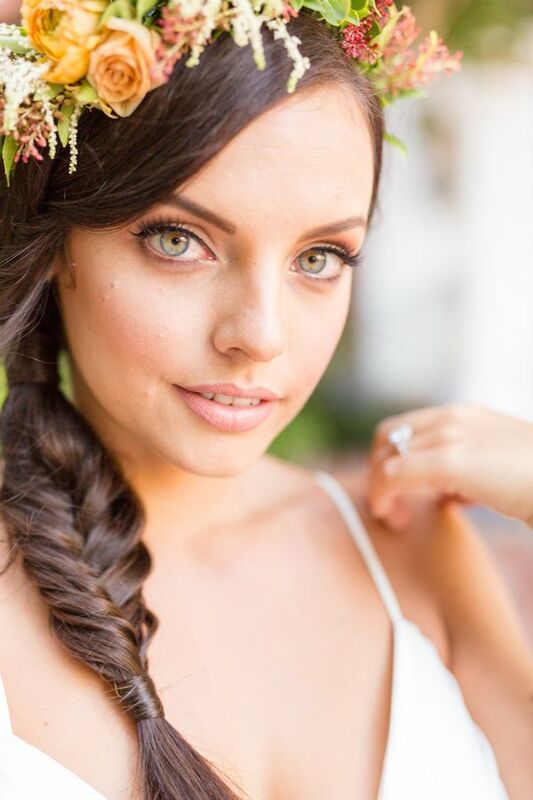 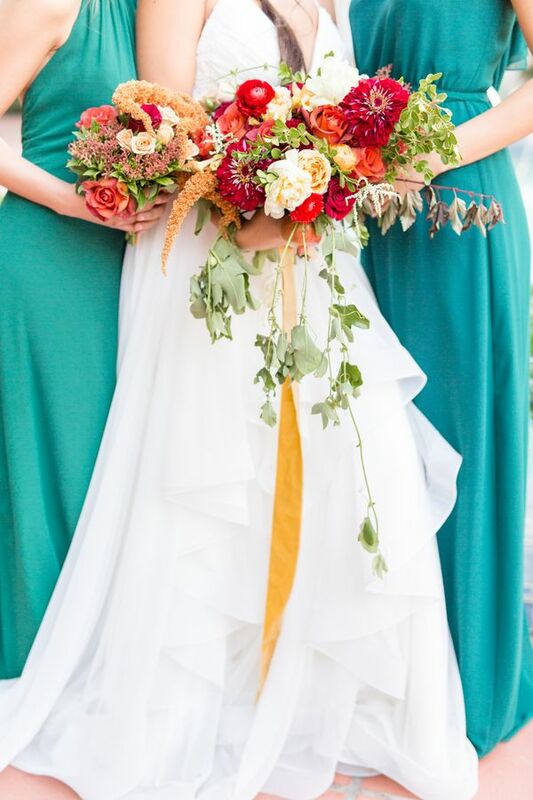 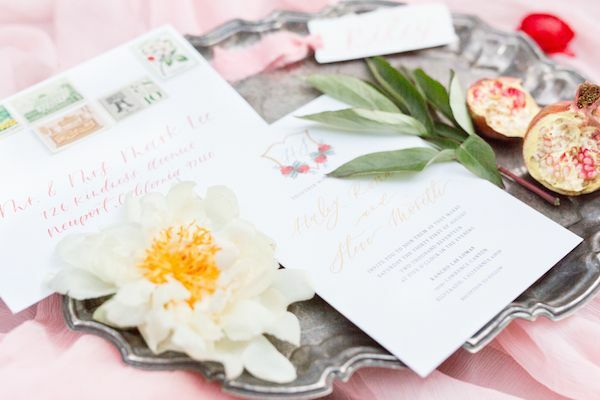 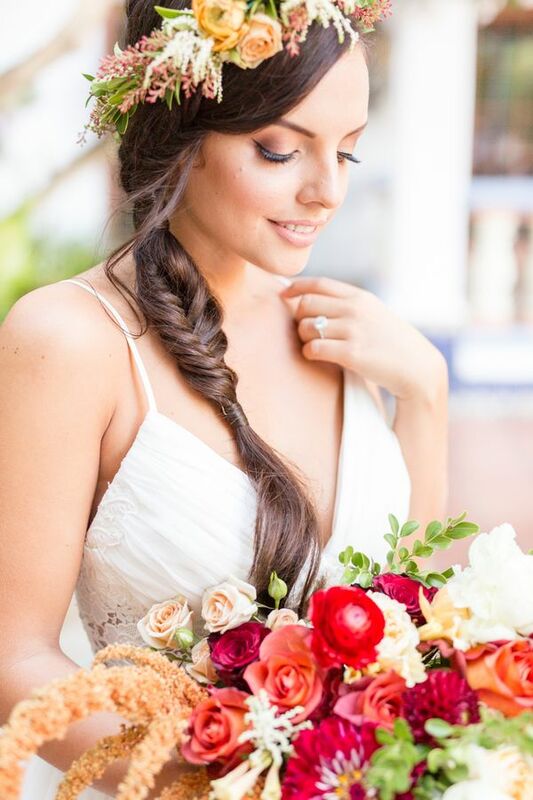 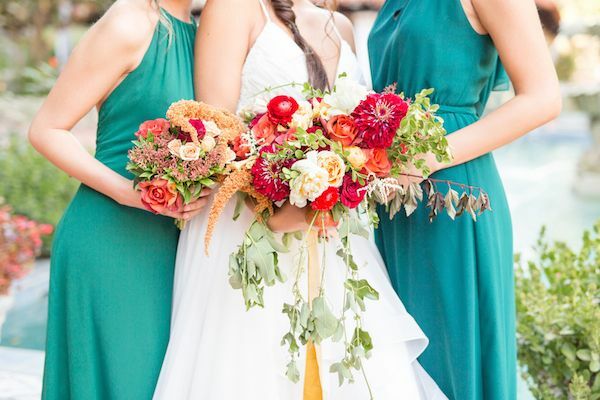 Cassia Foret whipped up the loveliest of florals on this day and lucky for us Gina Purcell Photography was there to capture every pretty detail. 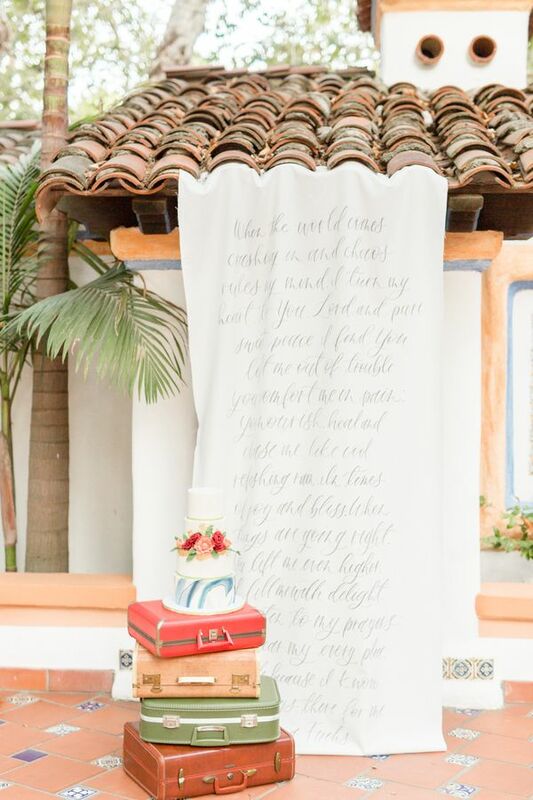 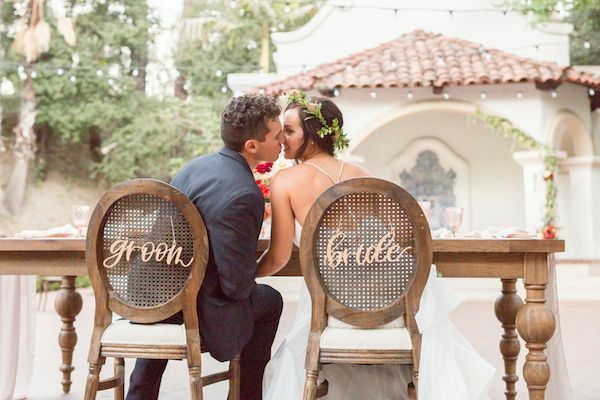 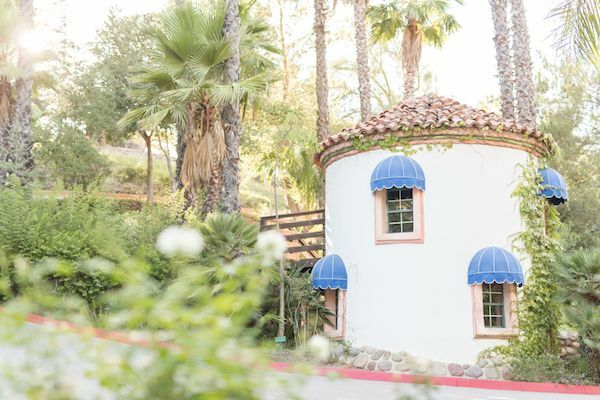 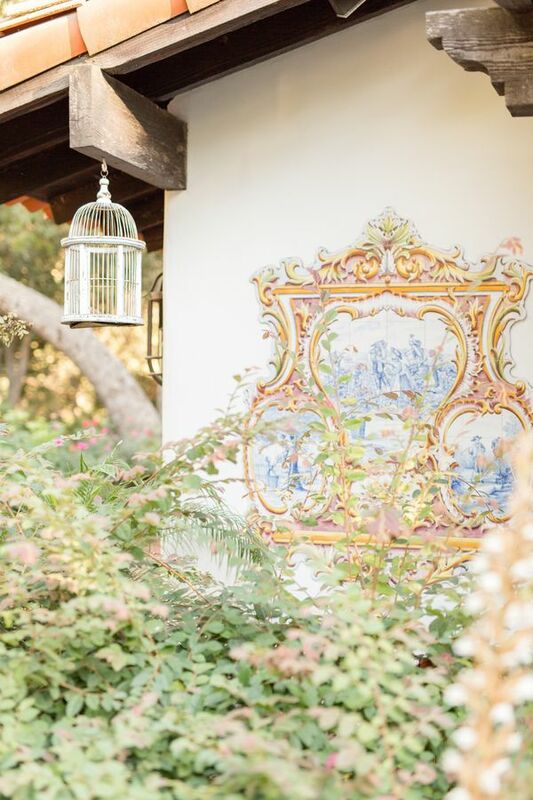 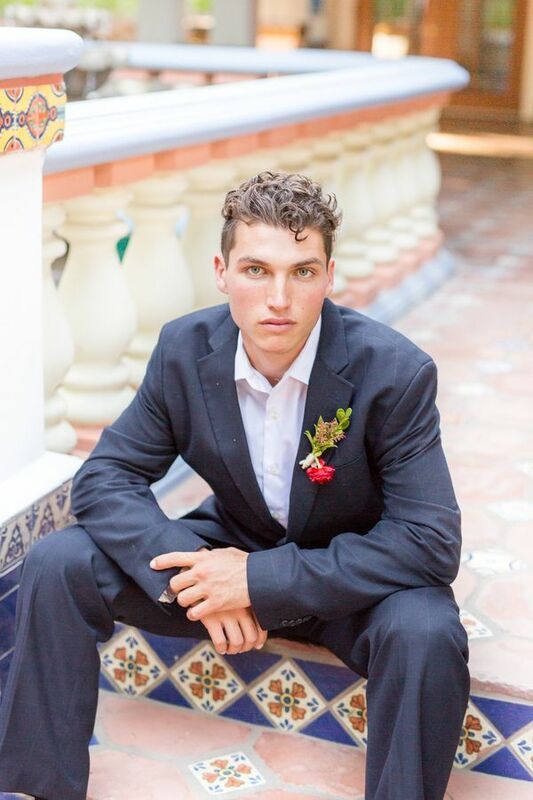 This richly romantic styled shoot took place at the gorgeous Rancho Las Lomas venue nestled in Silverado Canyon, California. 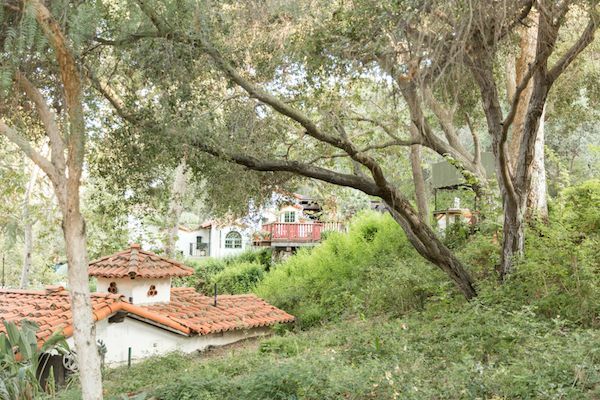 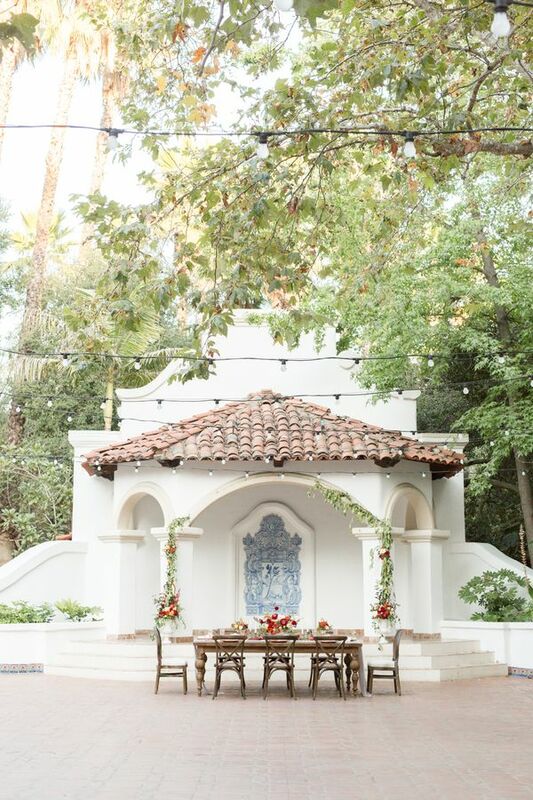 Deep rust colored terra cotta roofs contrast nicely against the white stucco and glistening aqua blue pool while lush green trees and foliage provide little peek-a-boo views to the gorgeous Spanish architecture. 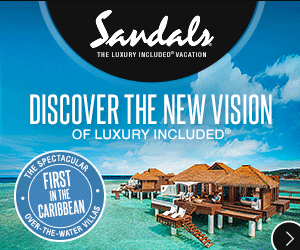 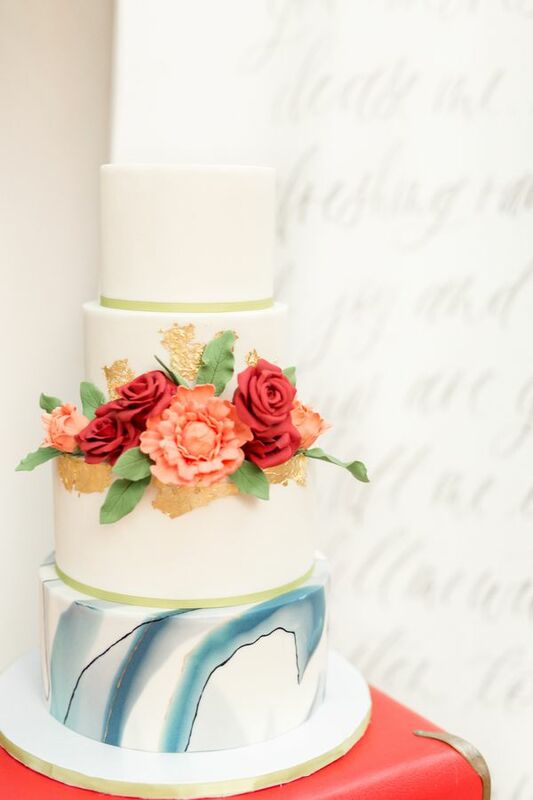 From the elegant and vibrant floral arrangements to the simple and elegant cake, no detail was left behind. 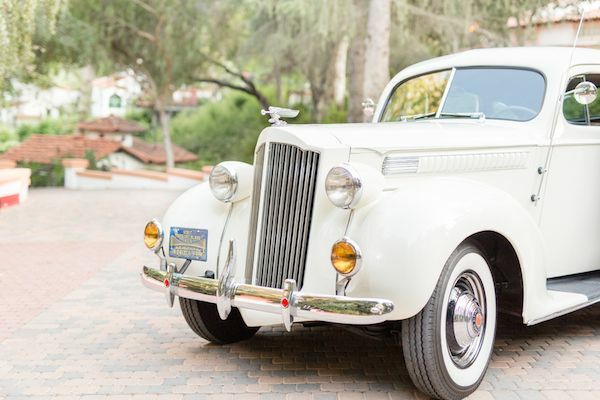 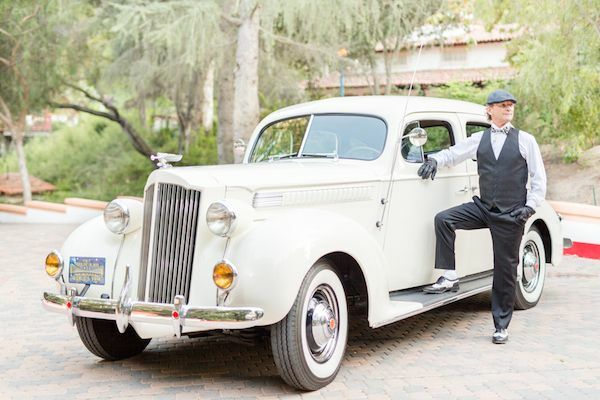 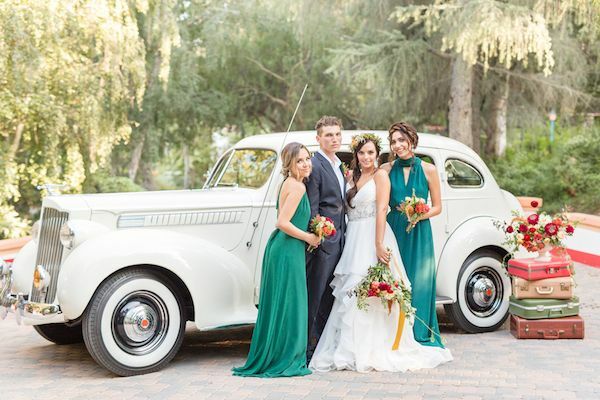 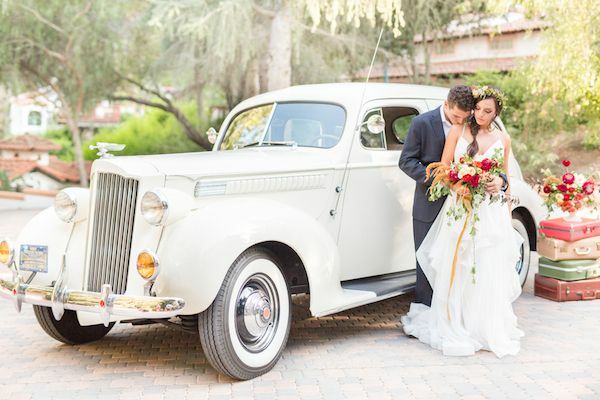 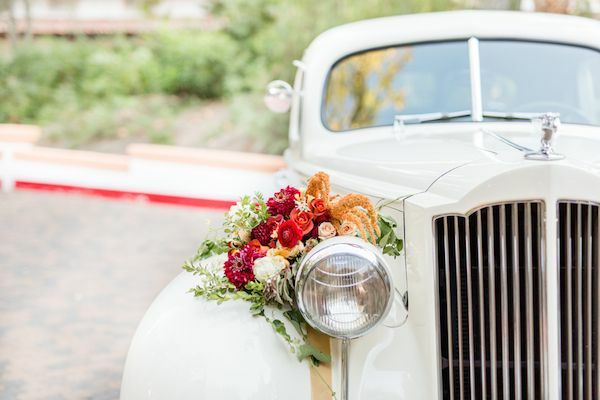 The dream-like vintage car provided a one-of-a-kind nostalgic element to the historic venue. 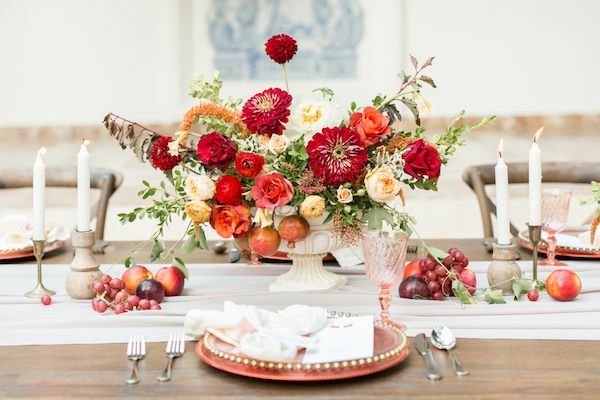 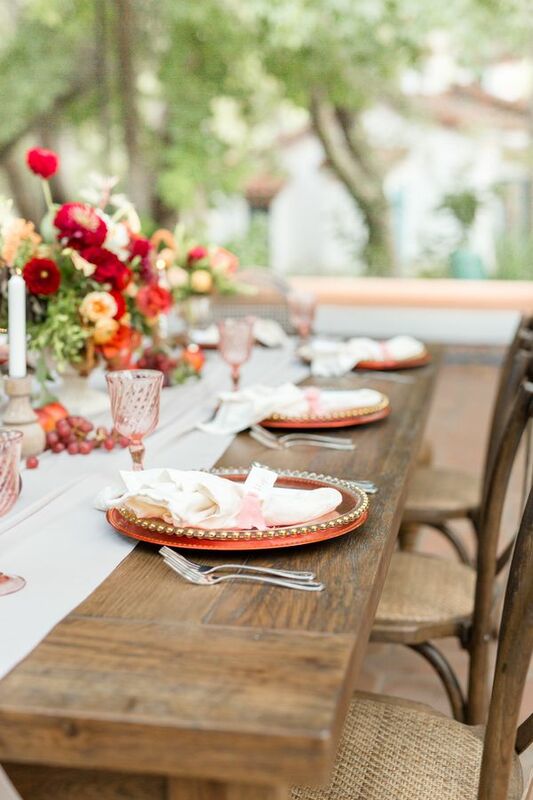 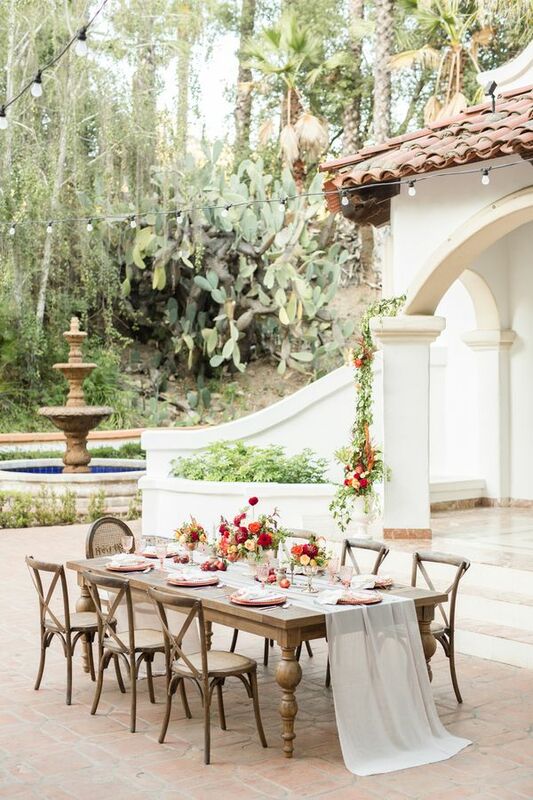 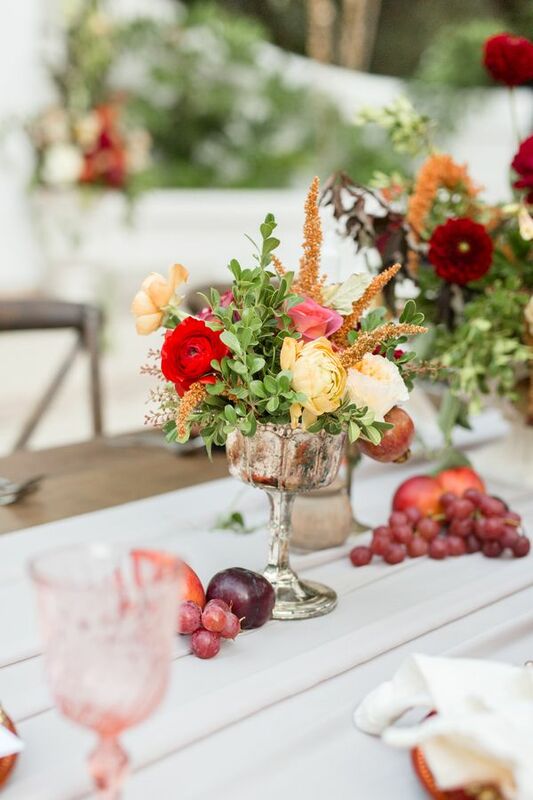 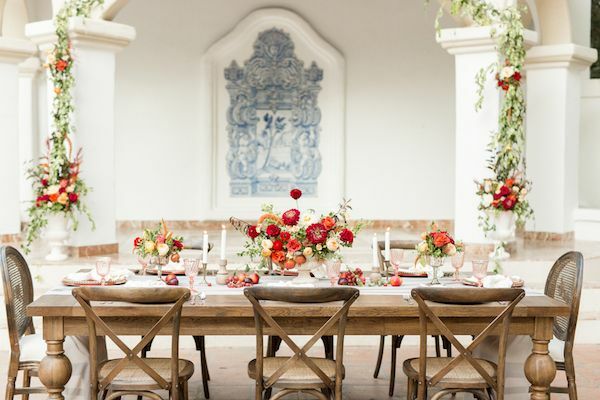 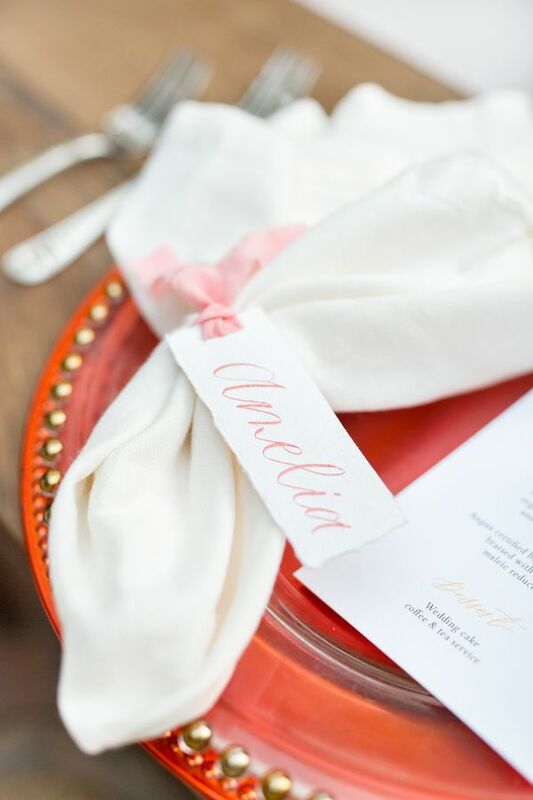 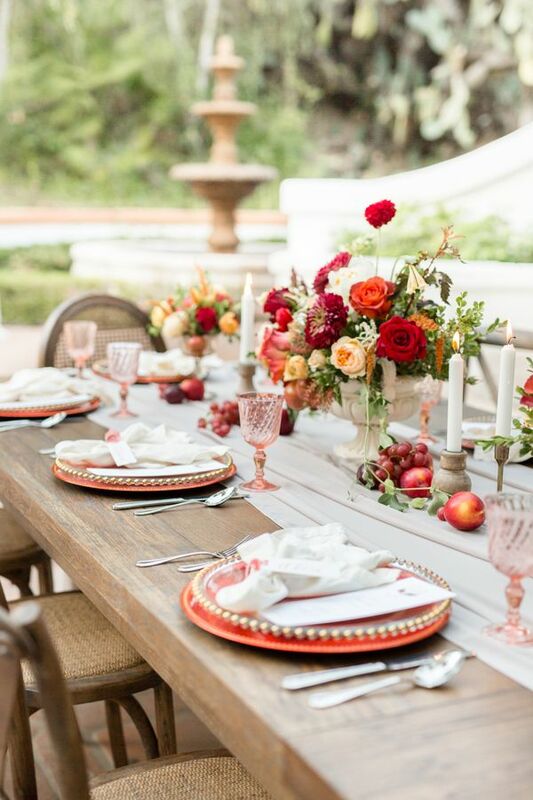 A gorgeous tablescape located in the middle of a terra cotta courtyard, lined with ruby red and apricot colors, fresh fruit and warm candles created a perfect reception space. 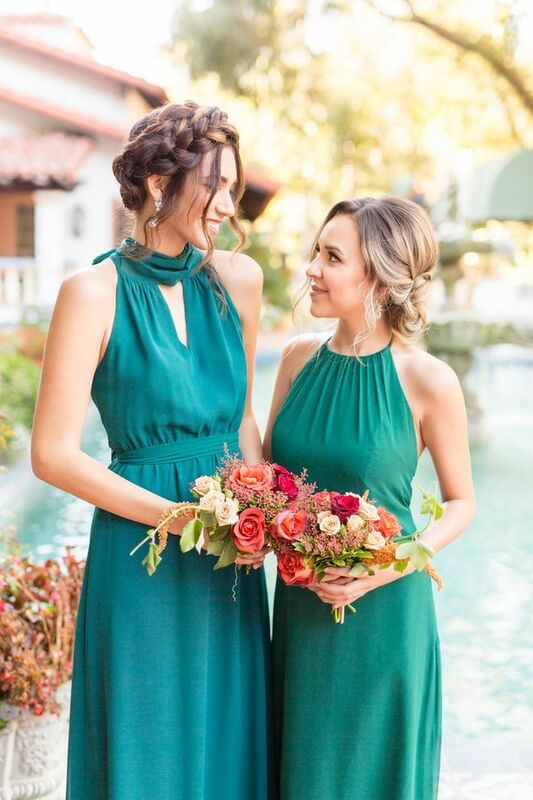 All the elegant details paired with a stunning couple and beautiful bridesmaids, made this romantic shoot a dream come true. 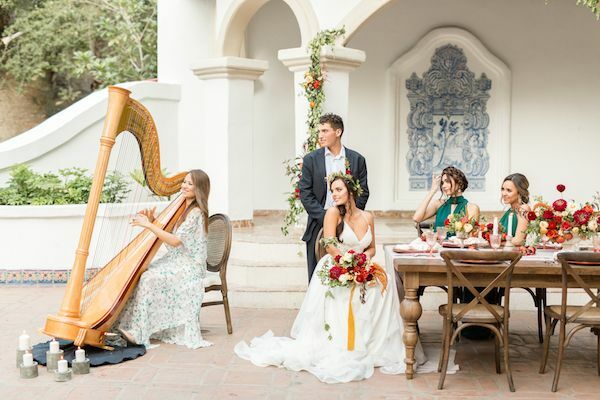 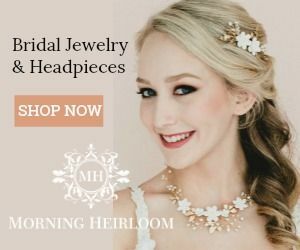 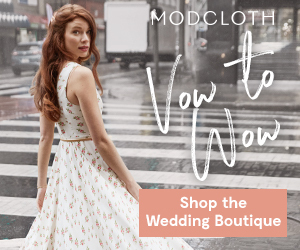 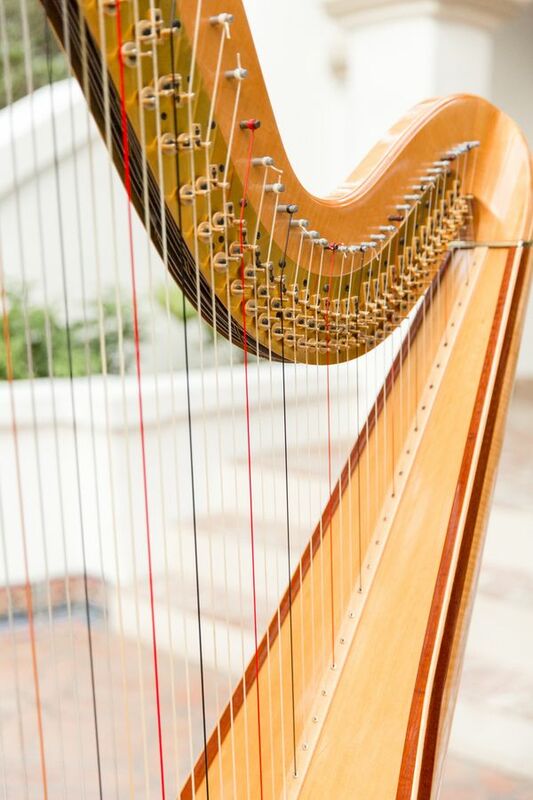 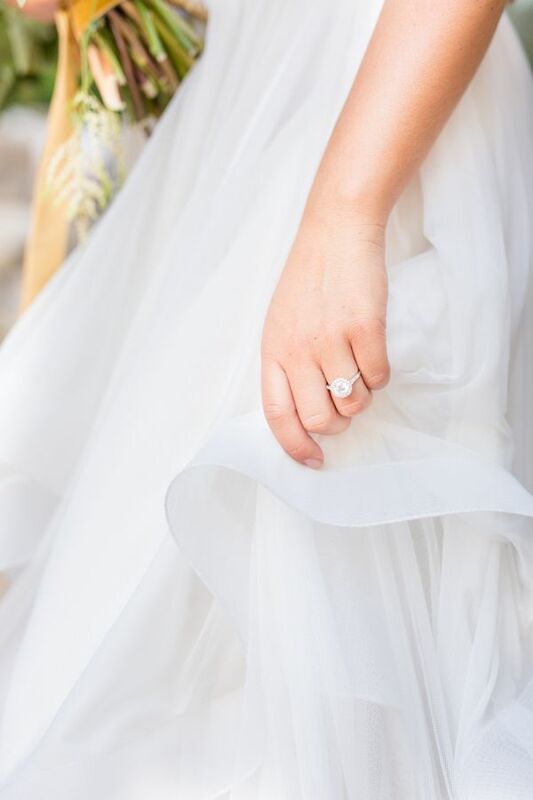 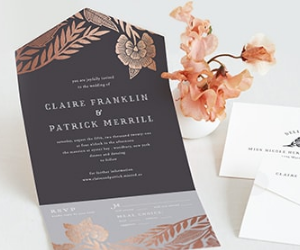 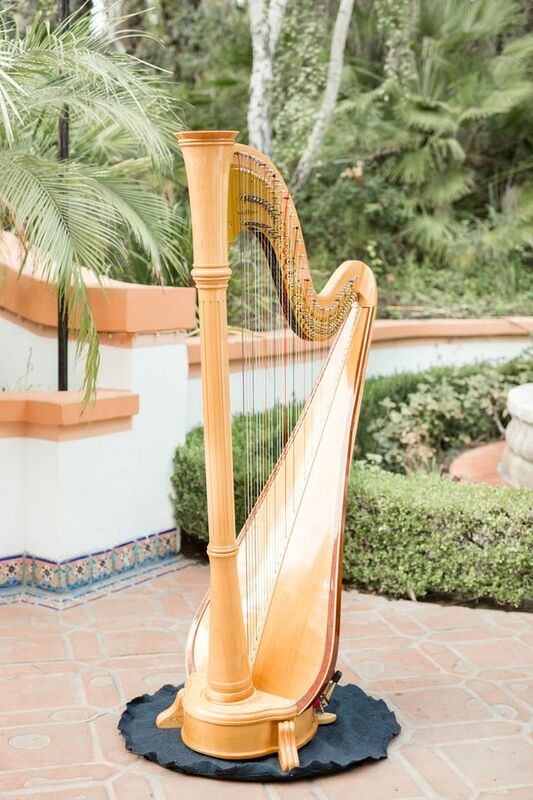 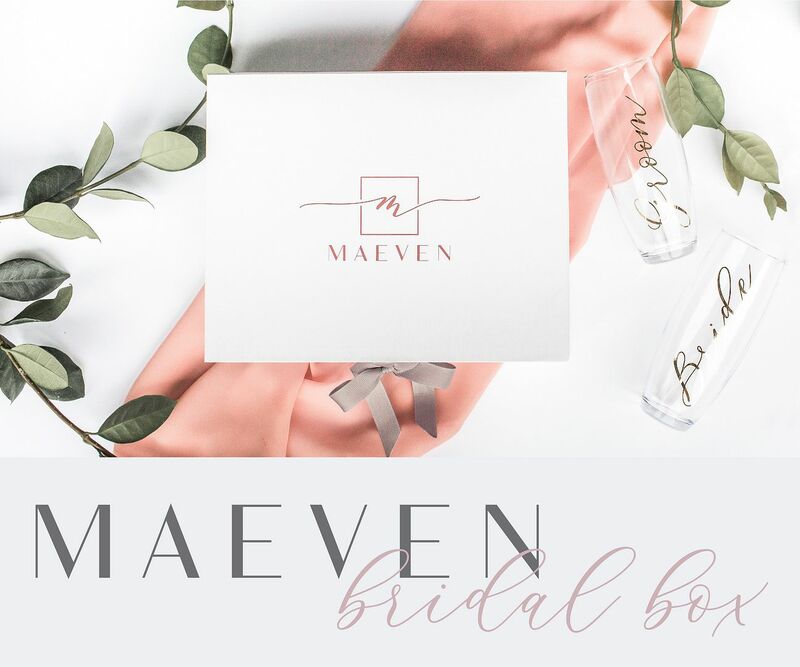 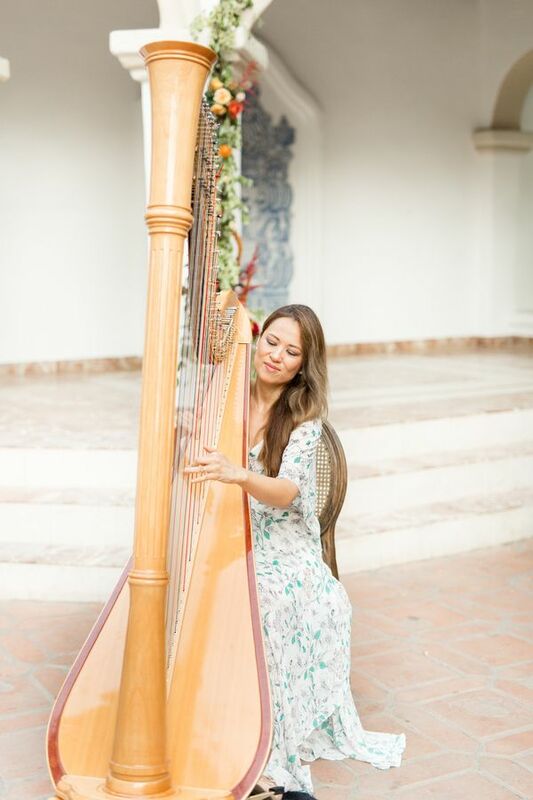 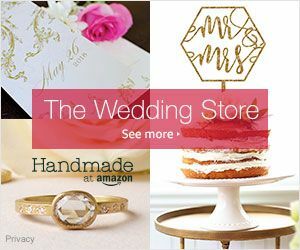 All the wonderfully designed elements draped with the perfect light, elegant harp melodies and fresh atmosphere would leave any inspired bride dreaming about her perfect wedding day. 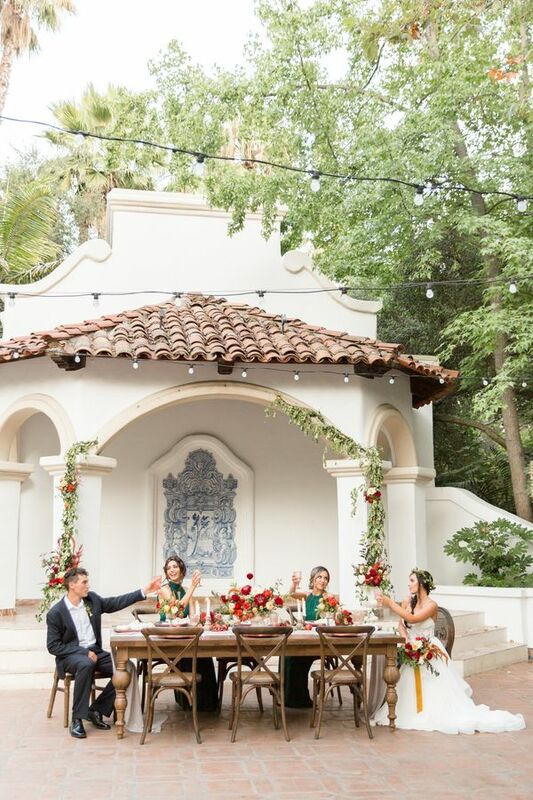 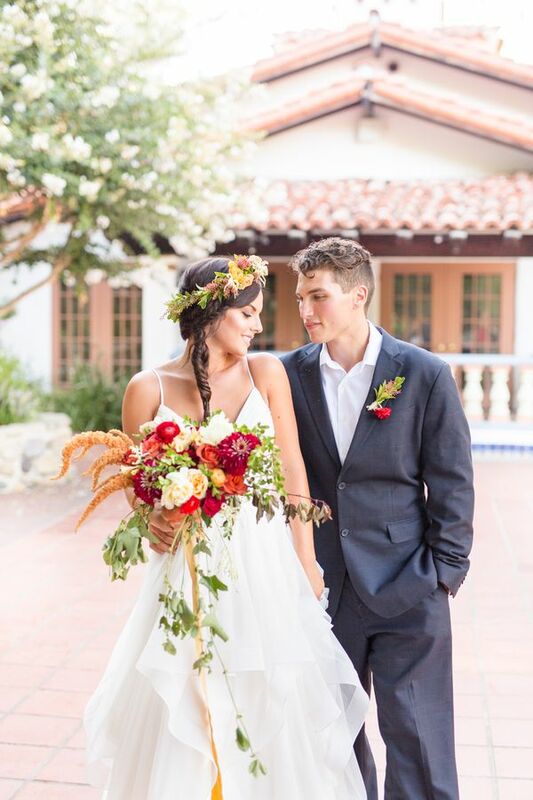 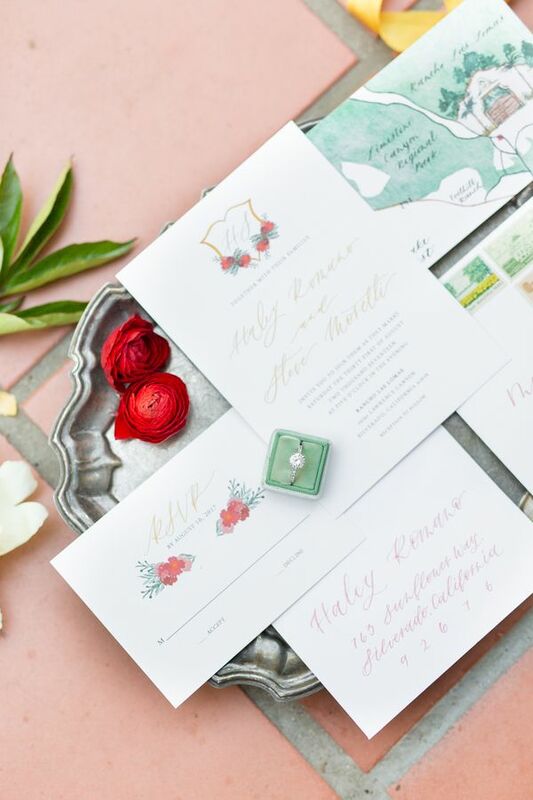 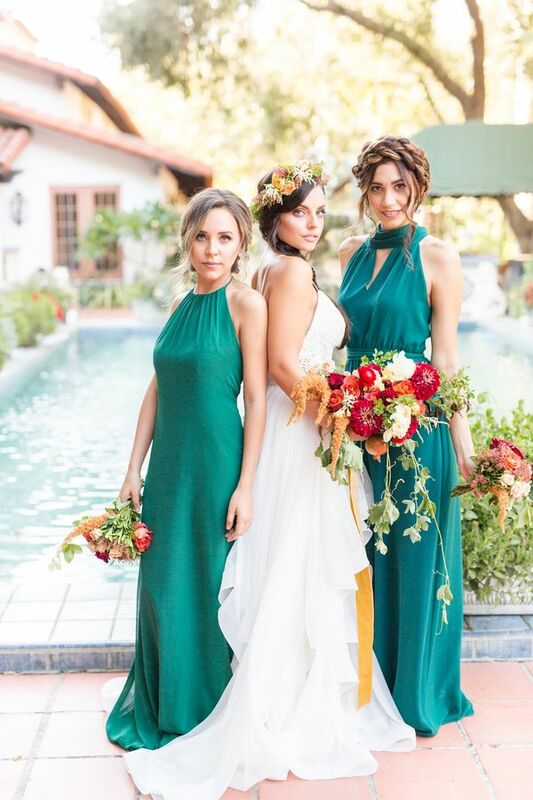 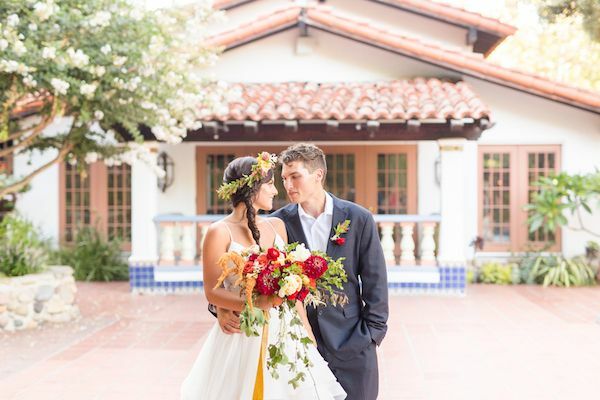 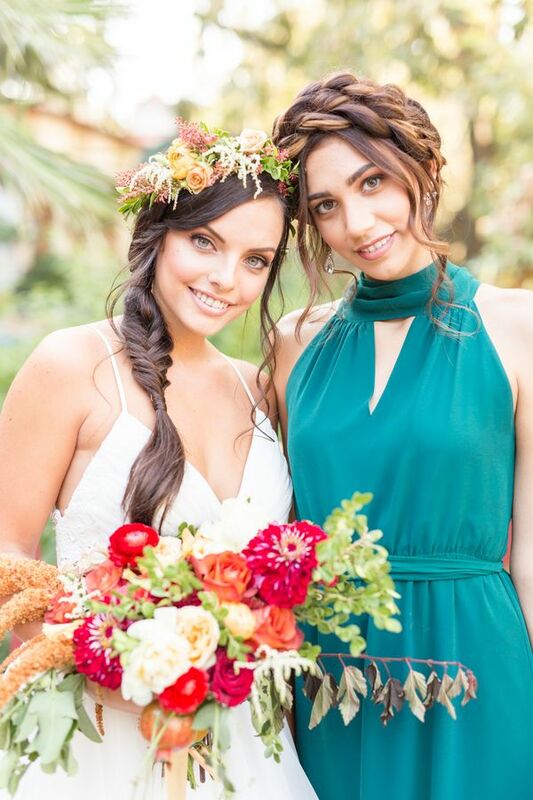 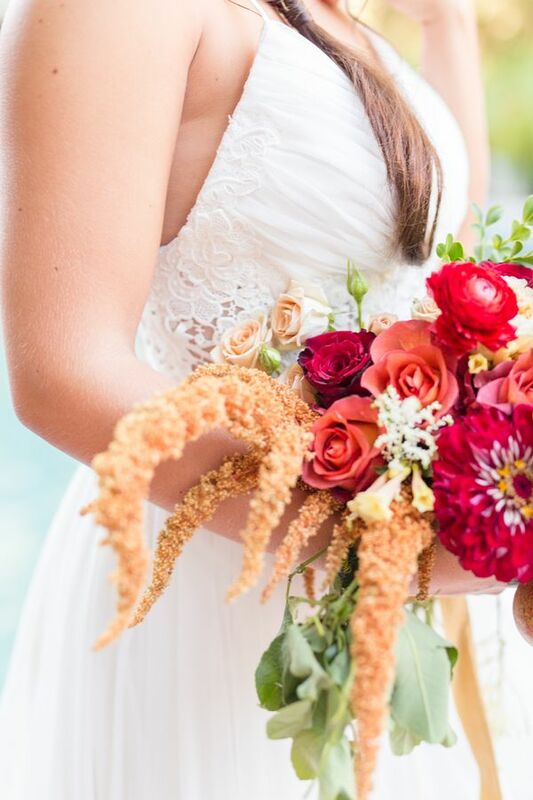 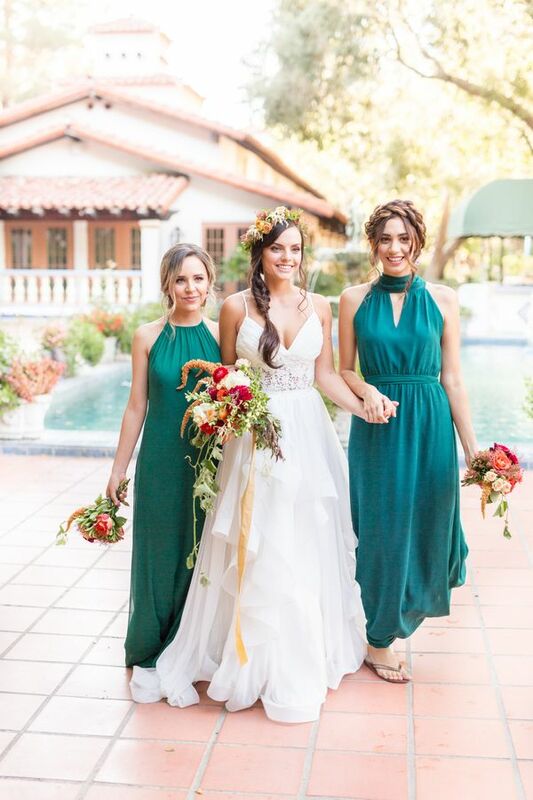 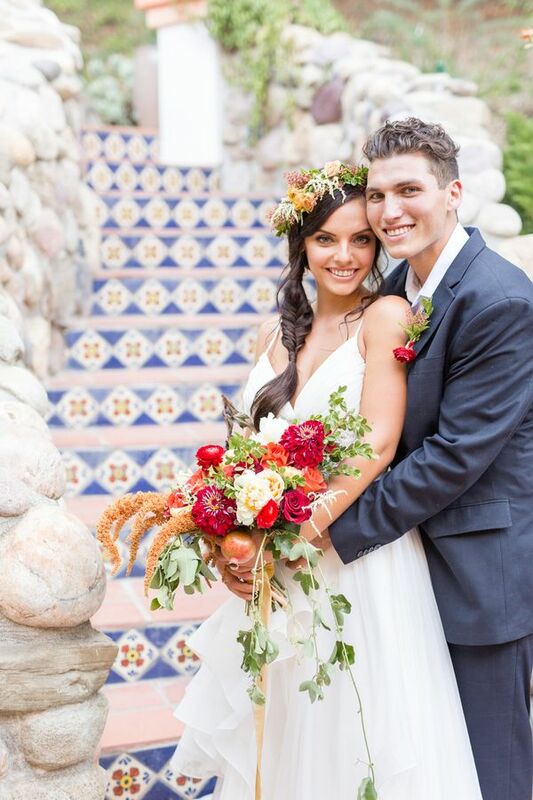 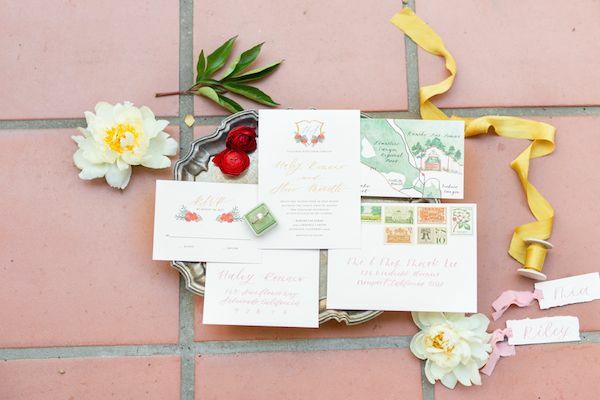 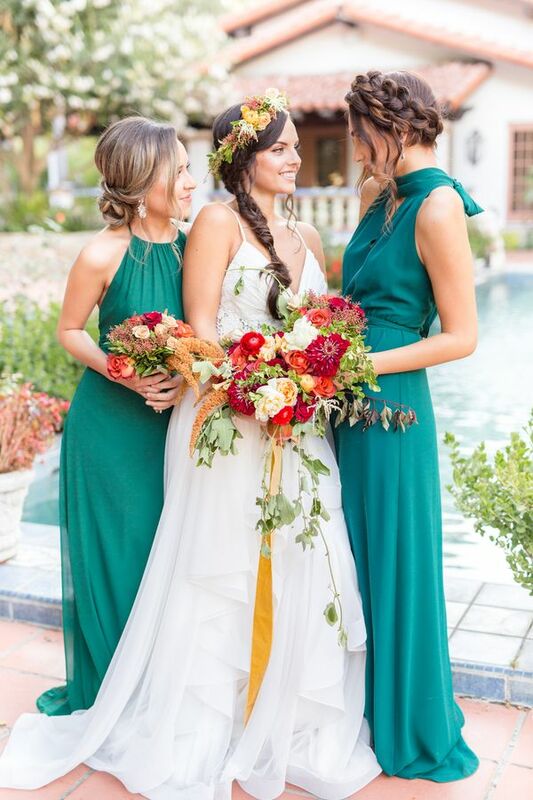 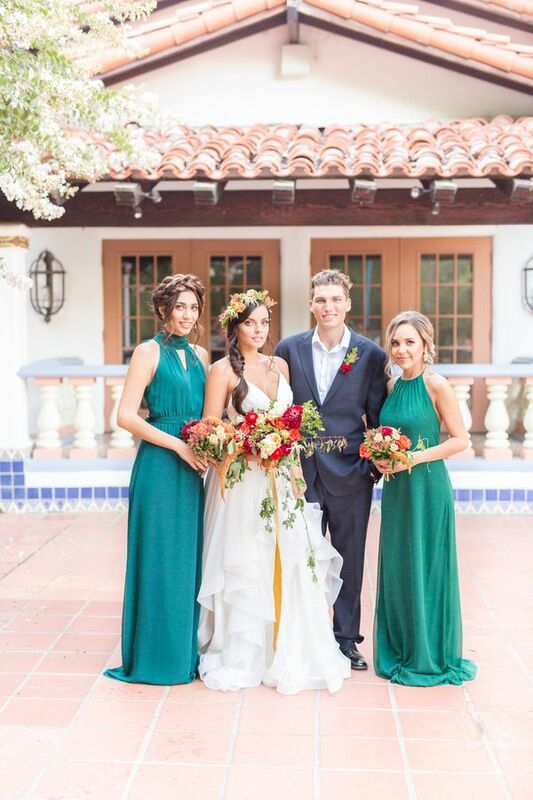 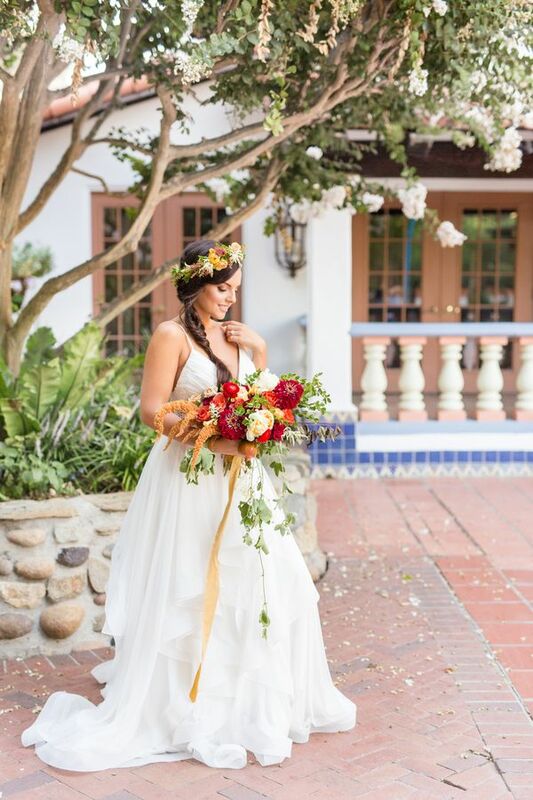 This beautiful fall inspired color palette of vibrant ruby red, peachy apricot with the pops of emerald green, complimented the gorgeous lush backdrop of the zoological garden oasis. 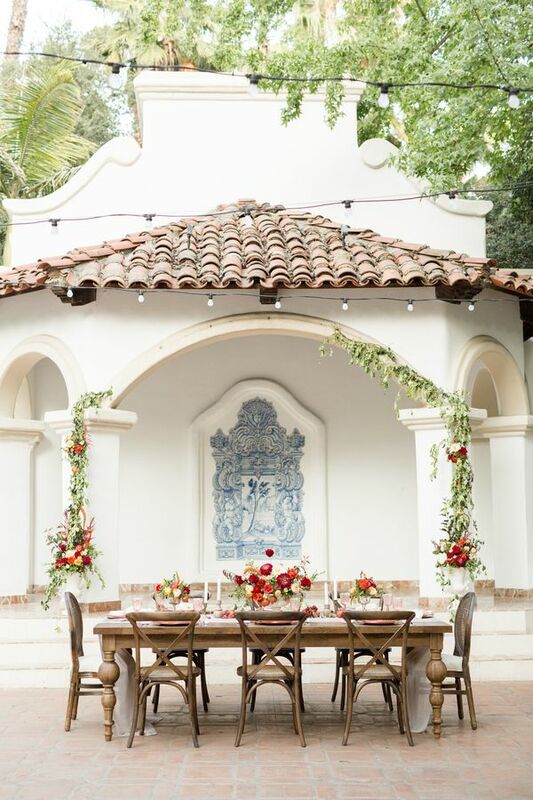 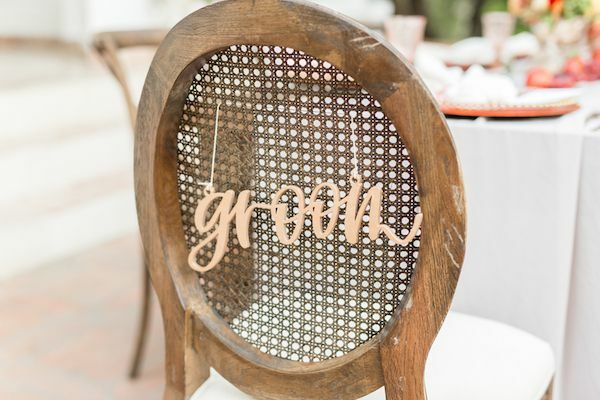 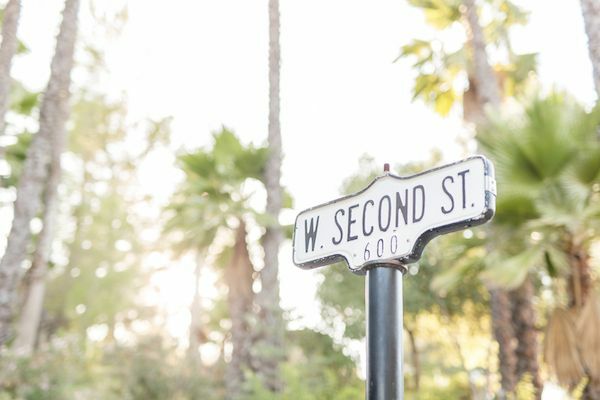 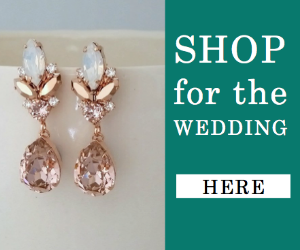 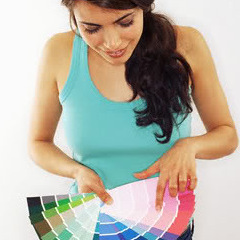 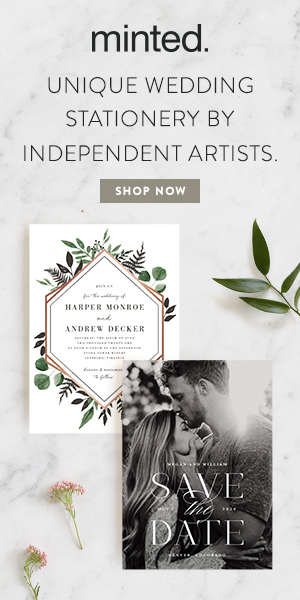 Rentals from Something Borrowed Party Rentals really helped set the scene for romance. 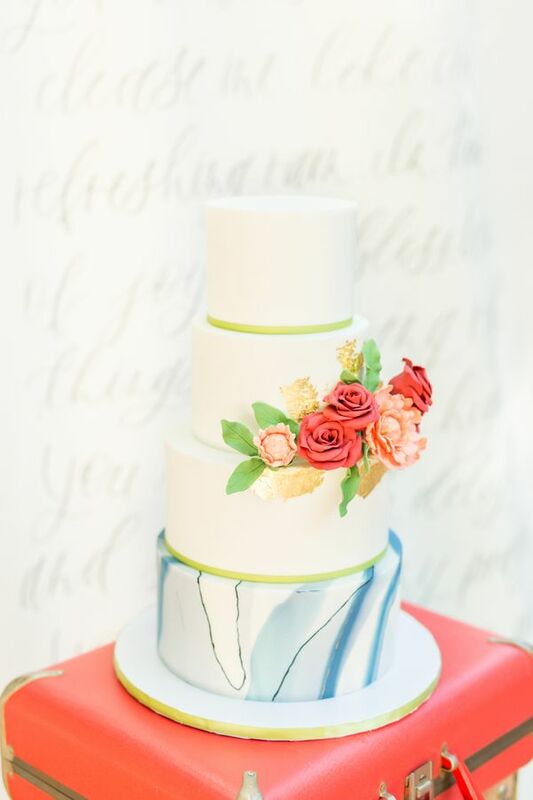 A colorful marbled wedding cake was nothing short of a work of art thanks to Frosted by Pibeny. 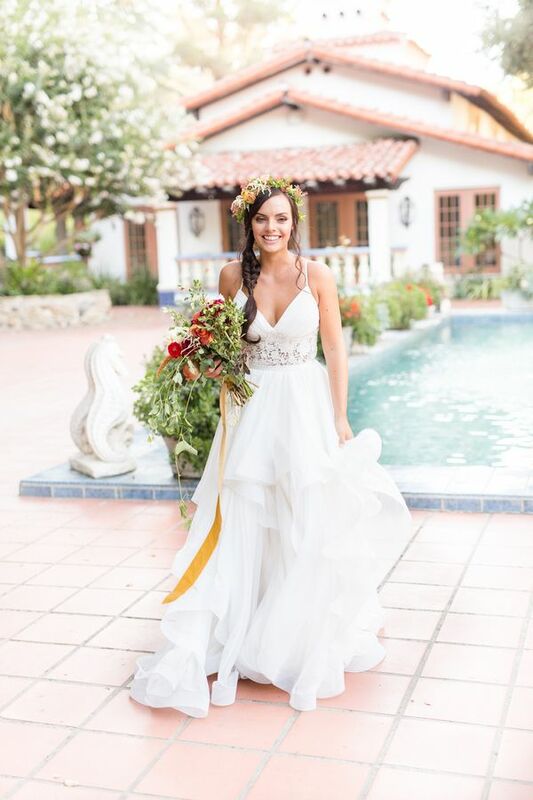 Photography: Gina Purcell Photography // Floral Design: Cassia Foret // Event Planning: Heather Benge Events // Reception Venue: Rancho Las Lomas // Rentals: Something Borrowed Party Rentals // Bakery: Frosted by Pibeny // Bridesmaid Store: Bella Bridesmaids // Dress Store: Love and Lace Bridal Salon // Calligraphy: Sozo Creative Studio // Makeup Artistry: Lip Glam Artistry // Hair Styling: Wedding Hair by Jillian Rae // Transportation: Lake Forest Limos // Musicians: La Harp // Linens and Coverings: Party Crush Studios // Model: Kristine M, Miranda Rodriguez, Lucas Moreno, Nani Parker. 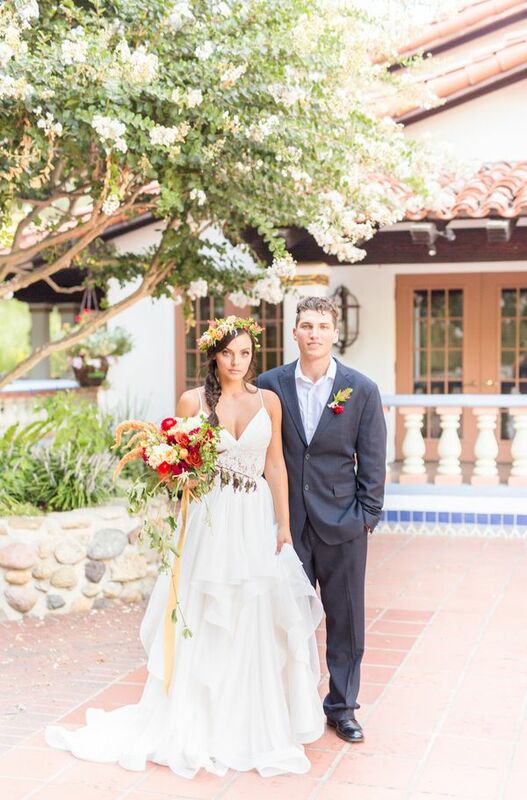 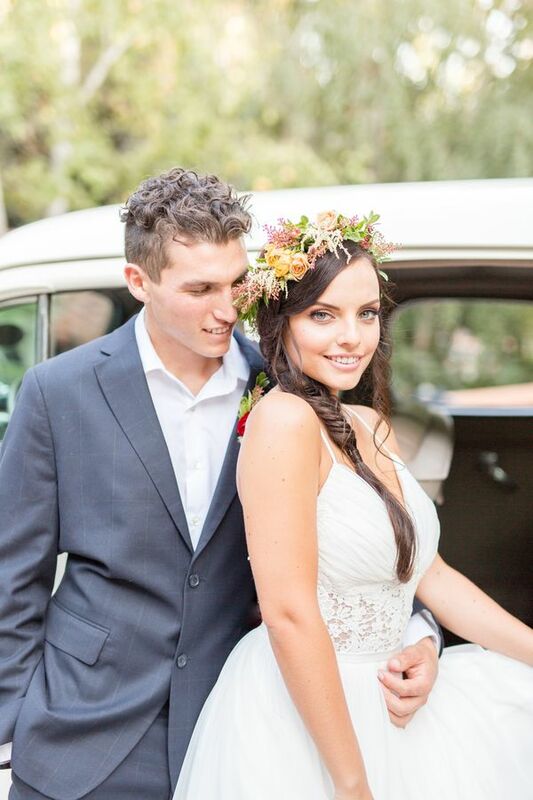 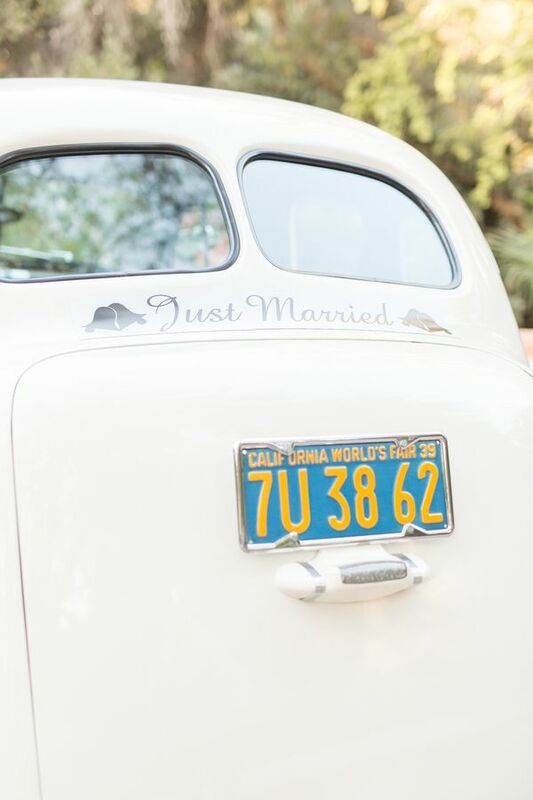 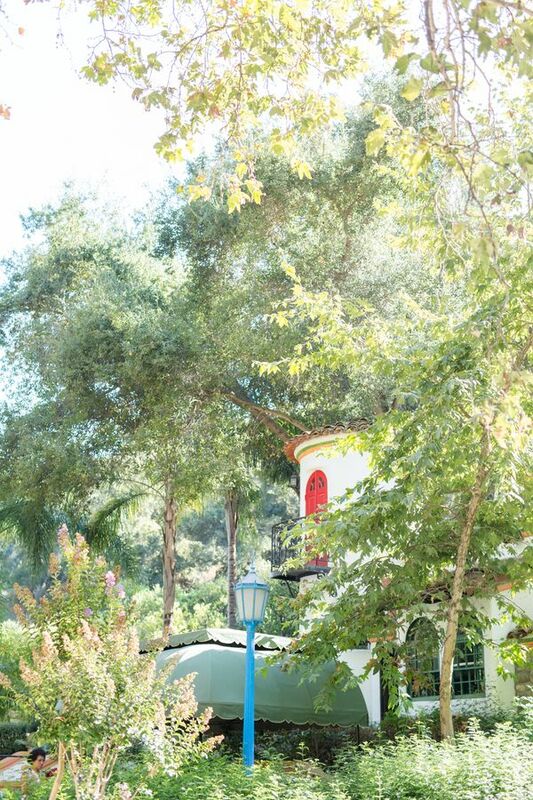 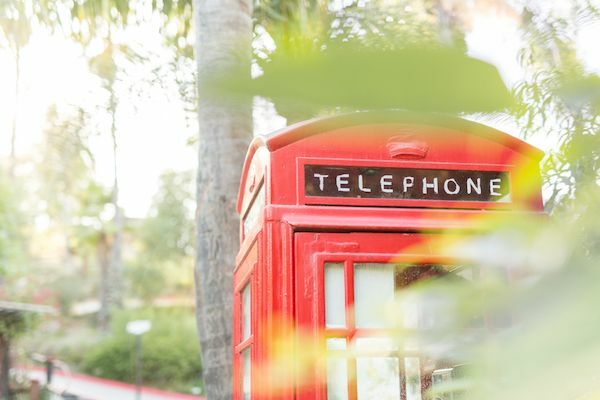 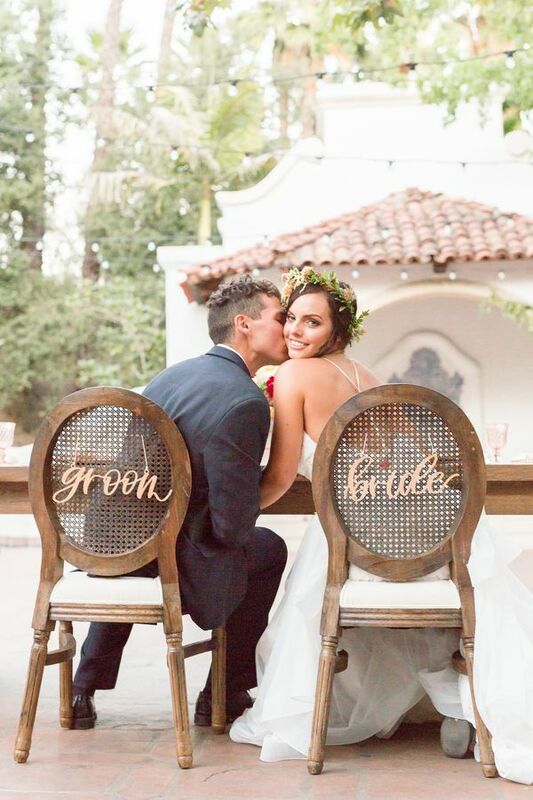 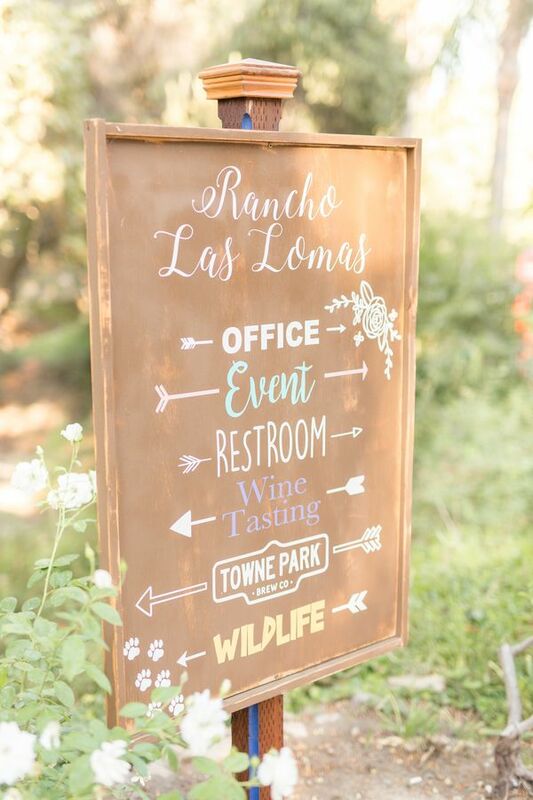 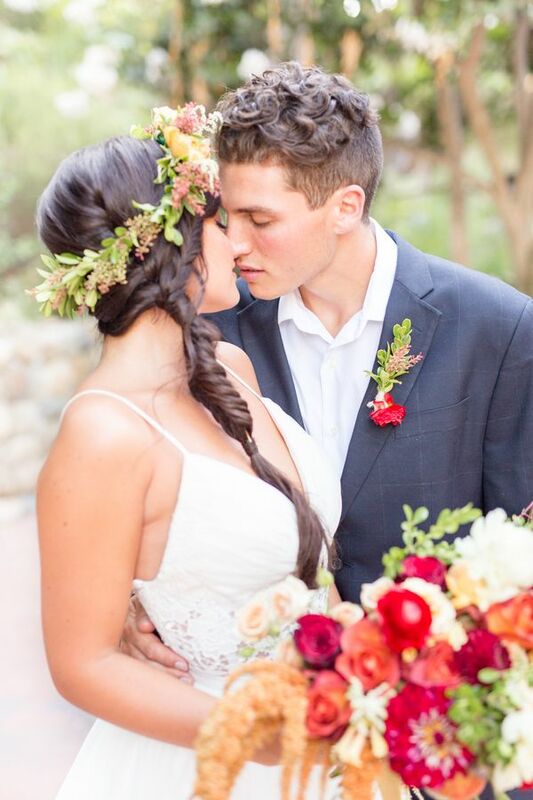 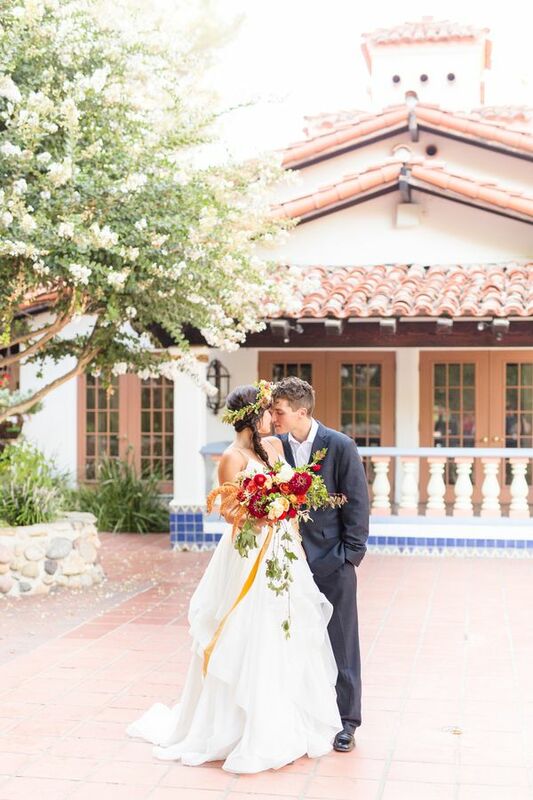 1 One Comment " Romantic Nuptials at Rancho Las Lomas "